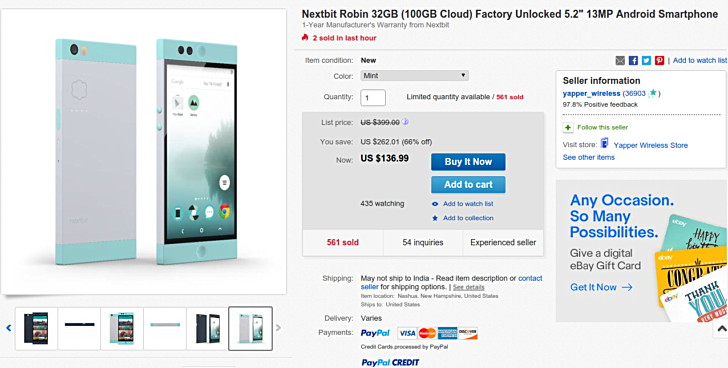 The cloud-focused Nextbit Robin smartphone is currently available for as low as $137 in the US. A seller on eBay is offering the phone (both Mint and Midnight variants) at this price. The handset's current official price is $299, but third-party retailers have the device listed for far lower price. For example, Amazon is offering the device for around $150. Still, the eBay deal is worth, as it saves you some more dollars. It should still be listed on GSMA even if the company doesn't make anymore phones.